Thermodynamic Diagrams for High Temperature Plasmas of Air, Air-Carbon, Carbon-Hydrogen Mixtures, and Argon provides information relating to the properties of equilibrium gas plasmas formed from hydrocarbons, from air without argon, from pure argon, and from mixtures of air and carbon at various compositions, temperatures and pressures. The data are presented in graphical rather than tabular form to provide a clearer picture of the plasma processes investigated. 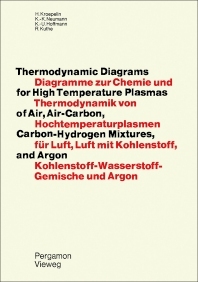 This book is composed of four chapters, and begins with the introduction to the characteristics of plasmas, with emphasis on their thermodynamic properties. The succeeding chapter deals with the theoretical basis of the computations of thermodynamic properties using a system of equations derived from quantized Boltzmann statistics. These topics are followed by discussions on the calculation of equilibrium compositions and the thermodynamic values for thermal plasmas. The final chapter describes proposed models on which the calculations are based. This book will prove useful to chemical technologists and researchers.